Often, when working with Live’s mixer and devices, you will want the controls’ movements to become part of the music. The movement of a control across the song timeline or Session clip is called automation; a control whose value changes in the course of this timeline is automated. Practically all mixer and device controls in Live can be automated, including the song tempo. During Session-to-Arrangement recording, automation in Session clips is always recorded to the Arrangement, as are any manual changes to parameters in tracks that are being recorded from the Session. To delete all automation data, right-click(PC) / CTRL-click(Mac) on an automated control to open its context menu and select Delete Automation. The automation LED disappears, and the control’s value stays constant across the entire Arrangement timeline and in any Session View clips. You can also delete selected portions of automation by editing breakpoint envelopes (see 19.5). You can also re-enable automation for only one parameter via the Re-Enable Automation option in the right-click(PC) / CTRL-click(Mac) context menu for that parameter. And in the Session View, you can re-enable overridden automation by simply relaunching a clip that contains automation. In the Arrangement View and in Session View clips, automation can be viewed and edited as breakpoint envelopes. To show automation envelopes, enable Automation Mode by clicking the toggle button above the track headers, or using the A shortcut to the View menu item. Note that you can disable Automation Mode by pressing the toggle button or A shortcut key again. 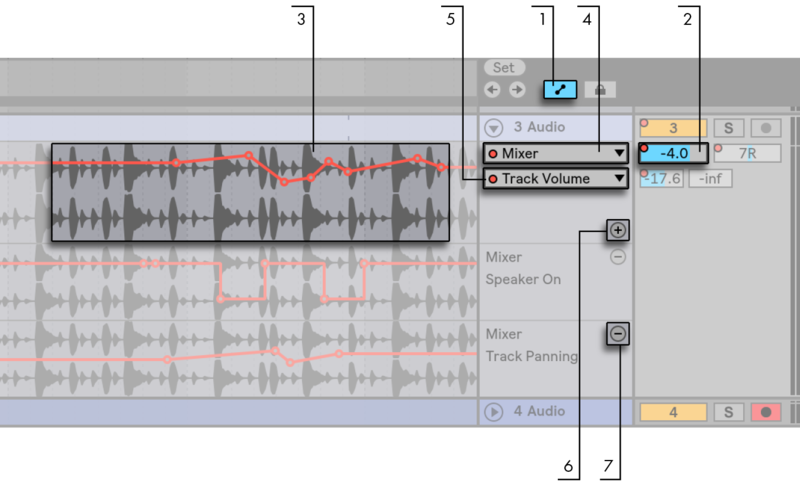 Clicking on a track’s mixer or device controls will display this control’s envelope on the clip track. Envelopes appear in the track’s main automation lane, “on top of“ the audio waveform or MIDI display. (This is useful for lining up breakpoints with the track’s audio or MIDI content.) An envelope’s vertical axis represents the control value and the horizontal axis represents time. For switches and radio buttons, the value axis is “discrete”, meaning that it operates with non-continuous values (e.g. on/off). The Device chooser either selects the track mixer, one of the track’s devices, or “None“ to hide the envelope. It also provides you with an overview of which devices actually have automation by showing an LED next to their labels. You can make things clearer still by selecting “Show Automated Parameters Only“ from the bottom of the chooser. The Automation Control chooser selects a control from the device chosen in the Device chooser. The labels of automated controls have an LED. The button moves the envelope into its own automation lane below the clip. You can then select another automation parameter from the choosers to view it simultaneously. Holding CTRL(PC) / CMD(Mac) while pressing the button moves the selected envelope, as well as all automated envelopes, into their own automation lane(s) below the clip. If the Device chooser is set to “None“, this button will be hidden. The button hides its respective automation lane. Note that hiding a lane from view does not deactivate its envelope. Holding ALT(PC) / ALT(Mac) while clicking the button removes the selected automation lane, as well as any subsequent automation lanes in that track. Clicking right-click(PC) / CTRL-click(Mac) on an automation lane header opens a context menu with additional options for viewing envelopes. This context menu also contains commands to quickly clear all automation envelopes for the track or any of its devices. To toggle Draw Mode, select the Draw Mode option from the Options menu, click on the Control Bar’s Draw Mode switch, or press B. Holding B while editing with the mouse temporarily toggles Draw Mode. Drawing creates steps as wide as the visible grid, which you can modify using a number of handy shortcuts (see 6.9). Holding down the Shift modifier while dragging vertically allows you to adjust the automation value of a step at a finer resolution. For freehand drawing, you can hide the grid using the Snap to Grid Options menu entry or the CTRL-4(PC) / CMD-4(Mac) shortcut. To temporarily enable freehand drawing while the grid is shown, hold down ALT(PC) / ALT(Mac) while drawing. Double-click anywhere in the envelope display that is not on a line segment, to create a new breakpoint there. Click and drag a breakpoint to move it to the desired location. If the breakpoint you are dragging is in the current selection, all other breakpoints in the selection will follow the movement. When dragging a breakpoint, a thin black vertical line will appear to help you see where your breakpoint is positioned in relation to the grid lines. Click near (but not on) a line segment or hold Shift and click directly on a line segment to select it. With the mouse button held down, drag to move the line segment to the desired location. If the line segment you are dragging is in the current time selection, Live will insert breakpoints at the selection’s edges and the entire segment will move together. Breakpoints created close to a grid line will automatically snap to that line. Breakpoints and line segments can be moved freely up to the next or previous grid line, and then will snap to each following or preceding grid line if you continue to drag. Breakpoint and line segments movements will also snap to an “offset,” which is based on the original placement of each breakpoint relative to the grid. Furthermore, breakpoints and line segments will snap to time positions where neighboring breakpoints exist. You can remove a neighboring breakpoint by continuing to drag a breakpoint or line segment “over” it horizontally. To help you edit breakpoints more quickly, automation values are shown when you create, hover over, or drag a breakpoint. Note that when hovering over or dragging a selected line segment, the automation value shown will correspond to the breakpoint closest to the cursor. When moving a line segment or breakpoint, hold Shift while dragging to restrict movement to either the horizontal or vertical axis. Hold down the ALT(PC) / CMD(Mac) modifier while dragging horizontally to bypass grid snapping. Holding down the Shift modifier while dragging vertically allows you to adjust the breakpoint or line segment value at a finer resolution. Hold ALT(PC) / ALT(Mac) and drag a line segment to curve the segment. Double-click while holding ALT(PC) / ALT(Mac) to return the segment to a straight line. When working with automation data in the Arrangement View, several Edit menu commands behave differently depending on whether or not your selection is within the clip track or its automation lanes. Cut, Copy, Duplicate or Delete commands applied to an envelope selection within a single lane will only apply to this envelope. The clip itself and other automation that occurs in that time selection will be unaffected. You can also work with envelopes in multiple lanes simultaneously. If you want your edits to apply to both the clip and all of its associated envelopes, ensure the Lock Envelopes switch is disabled and apply edit commands to a selection in the clip track. Note that these two controls also determine the value range of a MIDI controller (see 27.1) assigned to the tempo.